REI’s breakthrough product The ANDRE. 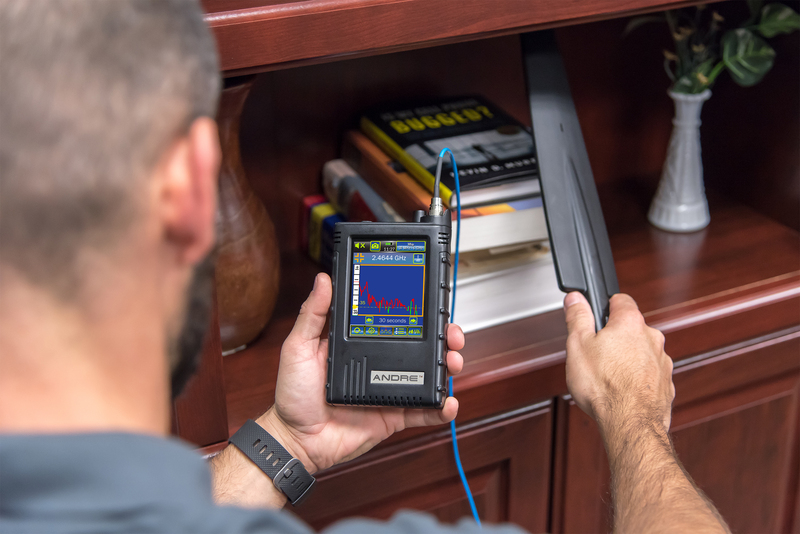 This state-of-the-art handheld broadband receiver analyses and detects known, unknown, illegal, disruptive, or interfering transmissions. 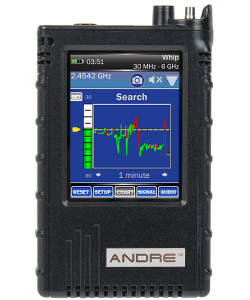 The ANDRE locates nearby RF, infrared, visible light, carrier current, and other types of transmitters. 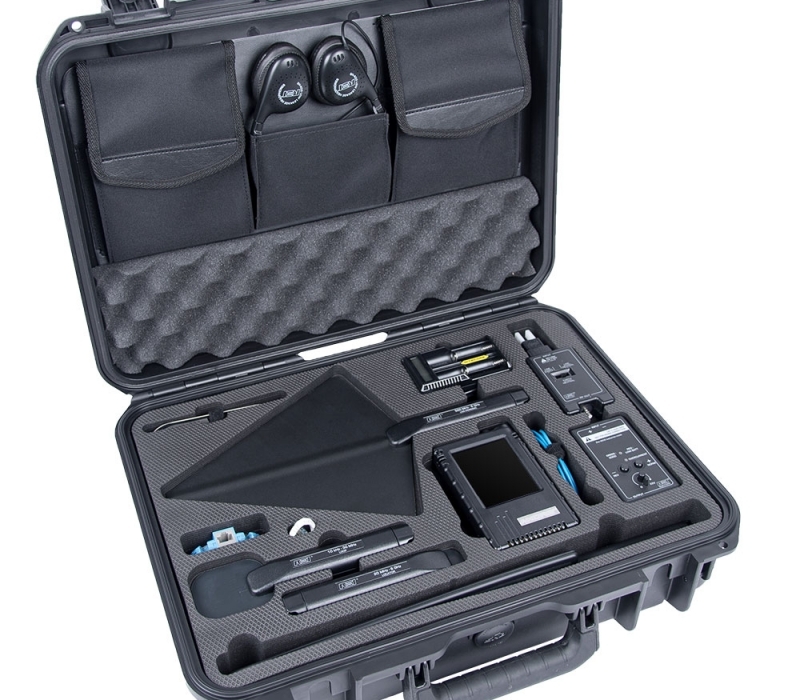 Quickly and discretely mitigate threats using the ANDRE Advanced Kit’s wide range of accessories specifically designed to receive transmissions across a 1 kHz to 6 GHz frequency range. Technical security specialists will appreciate the portability and responsiveness of the ANDRE. It is an excellent complement to an OSCOR Spectrum Analyzer as a preliminary non-alerting tool. POST-INVESTIGATION RESOURCES: Review time chart screenshots, playback demodulated audio, and review captured signal lists on a PC while writing your report. The Whip Antenna is a general purpose near-field antenna used to locate RF transmitters from 30 MHz to 6 GHz. The VLF Loop antenna is useful for analyzing the RF spectrum at low frequencies between 10 kHz and 30 MHz. Operating between 20 MHz and 6 GHz, the locator probe’s sensitivity is lower than other antennas and is used for locating an RF signal within a few inches. 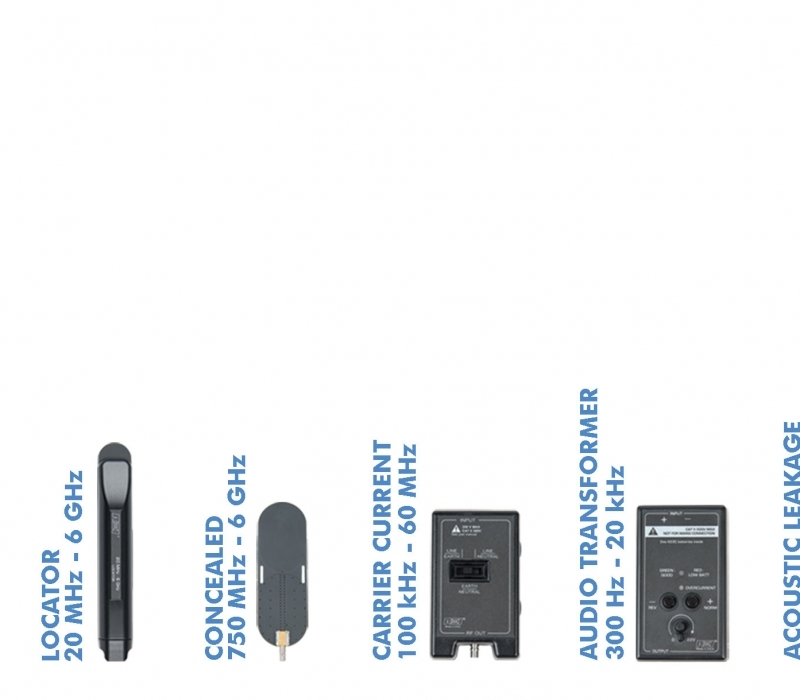 Operating between 750 MHz and 6 GHz, the concealed antenna is used for covert detection of devices. When connected, the ANDRE will automatically switch to Covert Mode by automatically disabling any alerting features. The ALD helps determine the vulnerability of acoustic leakage by placing the probe against structural objects such as walls or windows. The audio transformer test to see what, if any, audio is being transmitted down a physical telecommunication line between 300 Hz and 20 kHz. Tests for carrier current signals between 100 kHz to 60 MHz on any pair of conductors less than 250 volts. The directional antenna that detects signals from 500 MHz to 6 GHz. This probe is built-in to the top of the ANDRE unit and detects transmissions from 1 kHz – 50 MHz. When no other probe is attached, this is the default ANDRE setting. The Dual Bay Battery Charger allows the user to externally charge two (2) of the ANDRE Lithium Ion batteries. A quantity of two (2) Nitecore 3400 milliampere hour lithium-ion batteries for the ANDRE. This is an IPS stock item. For more information, demonstrations and pricing, please contact us using the links below.